The short version (yet slightly technical answer) is that yeast is a member of the fungus family and is a living single-celled organism that is self-reproducing. They are our microscopic buddies that do all of the hard work that change our wort into our magical beer. Depending on what kind of yeast you use, it can change the taste of your beer. Dry Yeast Or Liquid Yeast? Dry yeast is what most beginner home brewers start out with. 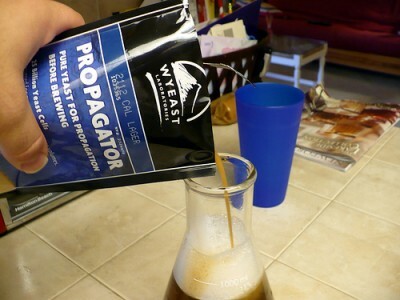 Dry yeast is a convenient way to get yeast for your home brew. In the right conditions (think refrigerated), it can store up to two years. However, dry yeast does require a liquid starter, which is one more thing you’ll have to do on the brew day. Liquid yeast has two big things going for it. It doesn’t require a starter, so that’s one less step you have to do. Plus, there are more versions of liquid yeast available on the market so you can make a wider variety of beer. Overall, it comes down to your own preference. I use liquid yeast as much as possible, but you should try both forms of yeast and see which you like better.